It only took a few hours after the proper people got ahold of the T-Mobile official MT3G Froyo update for that build (FRG83) to to be incorporated into CM6. To left (in English) is the phone information from the hybrid T-Mo/CM6 ROM. To the right is the CM6 nightly from 10/19/2010 (209). I did indeed notice a speed increase with the official ROM but was missing a number of the CM6 features. Now, as far as I can tell, nightly build 209 is just as fast as the hybrid T-Mo ROM and includes everything from CM6, which now has an option to show the powerstrip in the notifications window. To try a CM6 nightly, use recovery to back up your current CM6 install and flash the zip file containing the nightly There is no need to wipe, and you won't lose any apps or data at all. If you installed the hybrid ROM, first wipe (including cache), then restore the nandroid backup of CM6, and finally flash the nightly over the restored CM6 ROM. Keep in mind that nightlies are experimental builds. Some work great. Other much less so. For me and a number of people, 209 is working fine. Nightly build 208, the last one prior to incorporation of the official ROM, was reportedly very very slow. When 210 is released, it could be better, the same, or worse. If you have trouble with any experimental build, it will probably be best to go back to the stable release. Or skip to the end of the discussion of nightlies to try and figure out what the was the last one that was reasonably stable. Nightly builds can be downloaded here. Definitely faster than stock cm6, although I think I need to enable swap since can't really play music via subsonic anymore without stuttering a lot. I'm guessing it's running out of memory or the bluetooth drivers are crappier than before. Flashed 209 - noticed an increase in speed (slight but noticeable) from the get go. Still getting the occasional crash-to-reboot, though. Is anyone else? Is this a memory issue (as per Tommi Lätti's troubles with subsonic)? I doubt that would be why you are getting reboots. Getting a log when it happened would help. There may be some sort of app that will capture a running logcat. It's hard to plug your phone into a computer and capture a logcat of something that is randomly happening. If you've got time to deal with it, you can backup everything on the phone, including simeji and ADW launcher settings, and apps with Ti Backup. Also set the phone to sync your APNs and Wifi PWs with google. do a full wipe and reflash just 209 final by the proper Gapps Tiny. Then first go to the market and you should be able to automatically DL everything again. Though I doubt you are really interested in reinstalling. I just flashed a semi-generic based off of the TMobile official...what a difference from my previous cooked ROM. Fast all around, no glitches. ...works great (probably not too much different from latest AmonRa's Recovery wipe scripts though). Of course ensure adb is installed correctly. 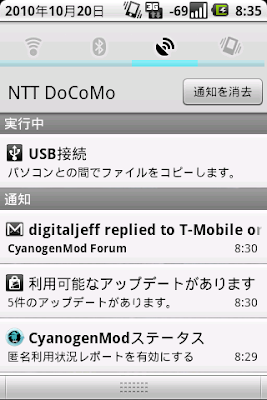 Hey Fuji, that's the same ROM that was posted on CM Forums, the same one from my previous post. It's the same guy who has different usernames on CM and XDA. Anyways, like I was saying, when I first flashed it, I did indeed notice a speed bump. Overall, everything was just snappier than before, but unlike some people, it wasn't night and day difference for me. I am guessing this is because my CM 6 stable install wasn't so slow in the first place (for whatever reasons, I don't know). On CM forums at least, many of the people that flashed it have gone back to CM with the 209 nightly, like I did. Right now, I am seeing the same performance in CM that I did with the mash up ROM from Stevo/amazinglarry311. HA! That's funny...I shoulda followed your link in the first place...would've saved me my own research time...lol. I'll probably play with this one for awhile and switch to CM at some point. I'm still reveling in the speed. Unlike the guy in CM forums who posted the "I cheated, I'm sorry, but now I'm back, CM6 - where do we start over?" I don't have that many apps, so hopefully won't run out of system part space anytime soon. I like your blog btw...someone who reads Japanese, can both appreciate the ironies of mobile computing in Japan _and_ technologically competent is a boon to the rest of us longtime gaijins....who may not all be Apple fanboys. Hey, glad the blog is useful for you! I used to be a big fan of Apple's, and I still prefer apple computers over a DIY linux box or Win 7 for everyday work and home usage, but the quality of the Mac hard and soft is slipping these days. I preferred their products when they were more expensive and less common because I had a much higher quality experience. Now that Apple had the "back to mac" event, maybe they'll get around to fixing some of the lingering issues with their current products, but I am pretty sure that ain't going to happen now that 10.7 has been announced. As far as the slow downs and battery life go, I am in agreement... I think. I don't think I've left a ROM on long enough to be sure if it is indeed slowing down, and as time goes by the number of apps invariably increases, meaning the chance that there is an app doing something in the background also increases. Background activity will use more battery. So, there is a chance that if you use the same ROM long enough, some crappily coded app or two (or three) will find its way on to your system a slow things down. On the other hand, all unix-like OSs that aren't on embedded devices are running cron jobs to clean up logs and just general maintenance, but I don't believe this is happening on Android. If you leave a ROM on for a long time, stuff would probably get cluttered. I've heard all sorts of battery life tips, like recalibrating battery stats from recovery after a full and complete charge - usually done by full discharging the phone by running down the battery normally, then booting in recovery or fastboot and letting it sit until it dies. Then fully charge with it off. Repeat. Then wipe battery stats after full charge. Basically, the battery isn't charging to full capacity, which is supposed to become more likely when flashing a bunch of different ROMs. This sounds like a myth, but at the same time I haven't heard people that I respect calling it BS, so it may be for real. Then there is this from and HTC engineer. Haven't tried it. Somebody needs to start cooking a CM6 209 rom that does have the minimum amount of apps (none of this amazon crap) inside. Call it a CM6Lite... oh and preferably launcerpro instead of AWD or good instructions how to replace that as a default. cmstats, dspmanager, email, facebook, genie, maps, music, protips, rommanager, soundrecorder, streetview and then replacing the awd. Maps & facebook come from the market anyway so no reason to have them in the system area anyway. Wait, so you didn't flash the tiny gapps? The tiny has maps removed already and is recommended with CM 6 because using less space in /system. As much as possible, I prefer apps to be in /data because when you update an app that is in /system, the original version remains in /system but the update gets installed in /data. So for a big apk like maps, you get two copies of it. This is why you have the option to uninstall updates for system apps. two days into using the 209 nightly and the random reboots have disappeared! super. if the problem returns I'll follow your directions. always appreciated! Oh and I went to biccamera today and had some quality time with the galaxy s, want it really badly now. Funny thing, it didn't have the android market icon anyway and I was looking. Not a problem to install afterwards but it's kinda bummer if your Average Joe here is stuck with the docomo market.